With Esright improved traditional door hinge mirrors, which is designed to enhance the stability. With the additional fixed pole, the mirrors are much stronger to bear more wind drags. While the streamline mirror back design with precision molding is also a good solution to deal with whistling. 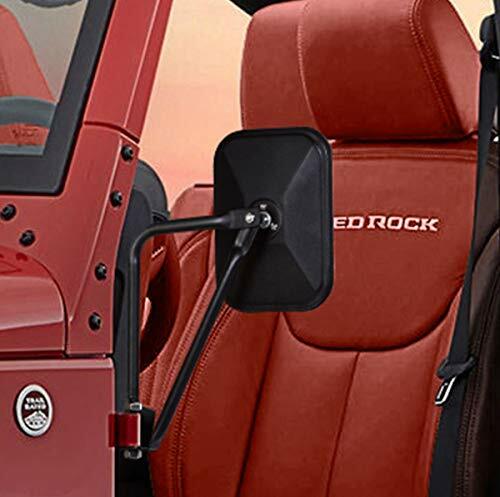 Only fit for 2007-2017 Jeep Wrangler (JK), 7.8 in large mirror with reinforced glass lens, offers wide view of vision without distortion, allowing you easily notice the obstacles/upcoming vehicles behind you, especially when you changing lane or reversing. With 0.4" diameter mounting bolt, it will easy to install and keeps you to be street legal for doorless jeep experience, fits to all Jeep Wrangler JK. Streamline design of mirror back and precision molding, effectively reduce wind drags and noisy whistling, enjoy your doorless safe drive! View More In Exterior Mirrors. If you have any questions about this product by Esright, contact us by completing and submitting the form below. If you are looking for a specif part number, please include it with your message.